Shep is a German Shepherd puppy of only 10 ½ weeks and we start his lessons with learning his name. We have made him aware that we have a treat which we will use first as a “lure” to get him to look up at my face and toward my hand. I hold my hand in front of my face and say his name in a conversational tone. When he responds favorably he will get the “reward” for performing the task. I use only one word. His name. If he looks up he is rewarded. If he doesn’t respond I do nothing. Positive response gets a positive reaction. Negative response gets no reaction. As an aside, when you offer the reward be sure you simply open your hand and let him take the reward off your flat hand. If we hold the reward in our fingers the dog has a tendency to try to get the treat from between your fingers and this can create a nipper. Not his fault. He is only trying to get the good stuff. If he doesn’t respond, be patient and stand there ready to offer the reward. He will ultimately look up (usually within 20 or 30 seconds) and as soon as he responds favorably, bingo!, the hand opens and he receives the reward. Many people from my classes tell me their dog mastered this in two or three days. Well guess what, if your dog doesn’t figure this out in three minutes you’re doing something wrong. The main thing is to use only the name, reward positive reactions, repeat regularly until the name is thoroughly entrenched. When you can speak the dog’s name from ten feet away and get a positive response five out of five times you can be assured that your dog knows and responds to his name. If he only responds on his terms when he feels like it, you can roll up the newspaper and hit yourself over the head and say you didn’t do your job properly. 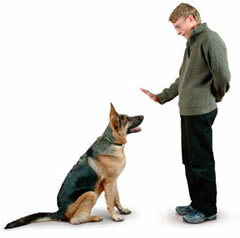 It’s important to understand that dogs don’t understand English (or Spanish, Russian, or Chinese for that matter) and our main task is to teach them one word at a time in a logical manner so they can associate a noise and a signal as being the command to perform a particular task. The reason we teach only one word at a time is many people run off at the mouth such as “Hey Buddy how’s my cute baby puppy, come over here.” Granted you did use the dog’s name but which of those ten words did you expect him to learn and which one is going to be his name?